Home oxygen is prescribed to patients who have difficulty inhaling sufficient oxygen through their lungs. Sea-level atmospheric air contains about 21 percent oxygen, whereas home oxygen delivery systems usually administer almost 100 percent oxygen, greatly increasing the amount of oxygen absorbed into the bloodstream through the lungs. Home oxygen systems typically come in three different forms: liquid oxygen, compressed oxygen and oxygen concentrators. Home oxygen systems can be very beneficial for people with breathing difficulties; however, care should always be taken when using a home oxygen system, because they do present some dangers. Contrary to popular belief, oxygen itself is not flammable. Instead, an oxygen-rich environment causes everything within it to burn faster and hotter. Oxygen can even make some materials burn that are not normally flammable. For example, Nomex, which is the material used to make the fireproof clothing firefighters wear, can be lit on fire in an oxygen-rich environment, explains the Massachusetts Executive Office of Public Safety and Security. Petroleum products pose a special hazard in high oxygen environments. Any product containing petroleum, such as some skin lotions, chapsticks or lubricants, may spontaneously self-ignite when brought into oxygen-rich environments. Because of the increased fire danger caused by oxygen, a person using home oxygen should never smoke or be in the same room as a person smoking while the oxygen tank is turned on. The flame from a match or lighter, and even the ember burning at the end of a cigarette, can cause any nearby materials--such as clothing, hair or furniture--to burst into flame. Severe burns on the face have resulted from people smoking while using home oxygen, reports an article published in the October 1998 issue of the British Medical Journal. Similarly, a person using an oxygen canister should stay away from candles and gas appliances, including gas stoves and water heaters. Compressed oxygen tanks also pose a danger of turning into an airborne projectile due to rapid decompression. 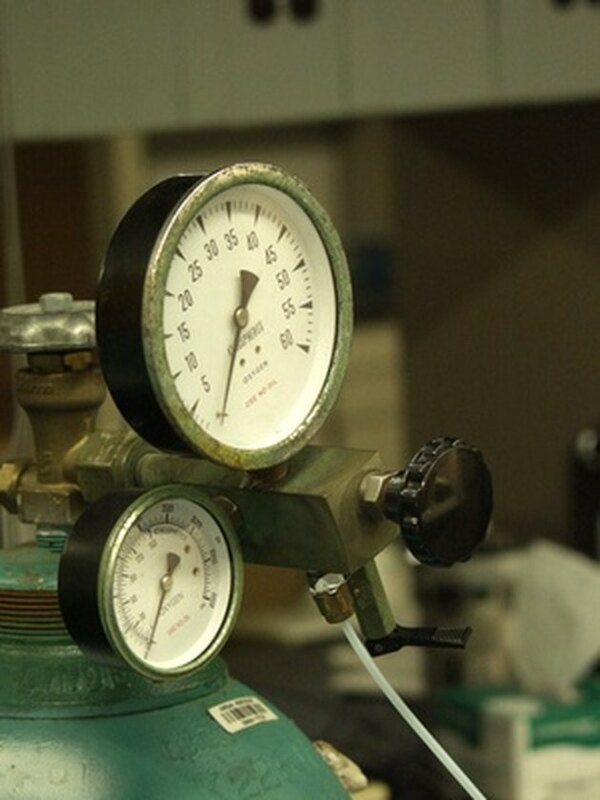 The oxygen in compressed tanks is under extremely high pressure. If the valve on top of the tank is damaged and begins to leak, the oxygen will spray out of the tank at rapid velocity, which can cause the tank to "take off like a rocket," warns the United States Fire Administration. Compressed oxygen cylinders should always be placed in a secure position or attached to a carrier to reduce the risk of a tank falling over and damaging the valve. In addition, the oxygen tank should never be carried or dragged while holding on to the valve itself. Oxygen masks worn on the face for long periods of time can cause irritation to the face and may rub away the skin, leading to open sores, the British Medical Journal reports. Alternatively, if oxygen is delivered through tubes in the nose, which are known as nasal cannulae, the nasal passages may become very dried out, sometimes leading to cracked skin. Liquid oxygen systems carry the added risk of frostbite. Oxygen can only be stored as a liquid at very low temperatures. As a result, the metal connectors between parts of the oxygen system may also become very cold, and may cause frostbite if they come into contact with skin.